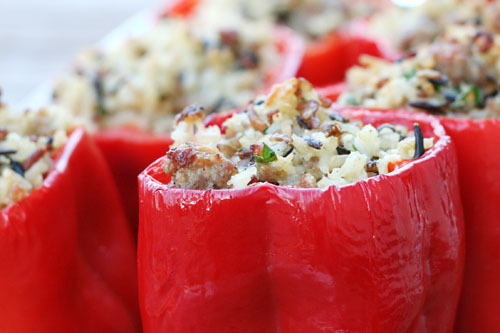 These stuffed peppers are worth stuffing…into your face, your mouth, your belly. You will stuff yourself silly. I’ve been wanting to share this recipe with you for weeks and the stars have finally aligned. My friend Julia served these to us a month or two ago…I think that night I might have eaten 3 peppers, but who’s counting? I’m telling you, they are DEEE-LISH. Without further ado (I think I might say that too much on here…whatever)…the recipe! Cut tops from peppers and remove seeds and ribs. If your peppers don't want to stand up nicely, cut off part of the bottom as well to level the base of the pepper. Try not to cut through to the inside, but if you do it's not the end of the world. Brush outside of peppers with olive oil. In a medium frying pan, heat remaining olive oil over medium heat. Add onion and cook 2-4 minutes, or until softened. Crumble sausage meat into pan and cook, stirring to break up lumps, until it begins to lose its pinkness, 5-7 minutes. Drain the fat (use a slotted spoon or pat with papertowels). Slightly beat egg in a large-ish mixing bowl. Add rice, parsley, cheese, salt, pepper and sausage/onion mixture. Mix well. 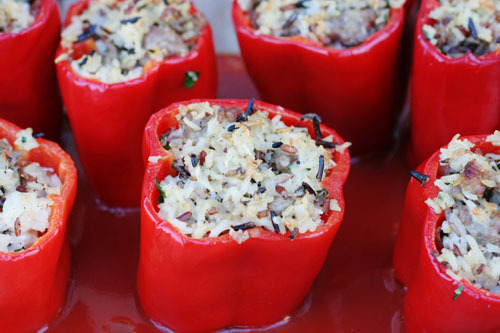 Stuff the bell peppers with rice filling, mounding top slightly. Place peppers in a 9" x 13" baking dish. Mix tomato sauce with water and pour into dish around peppers. Bake 45 minutes. Cambria Cove Shopping Spree Winner! 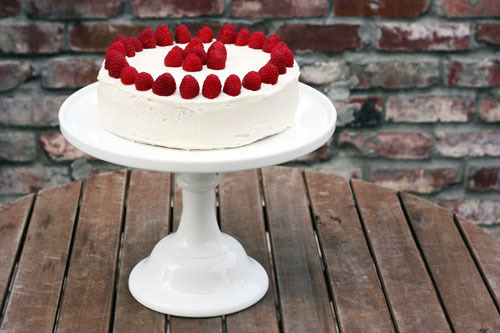 For the rest of you…if you didn’t notice, my cake platters are ON SALE, here and here and here. Just sayin’. I think you all should get some so we can match. Thanks again to Cambria Cove for such a fun giveaway! I loved reading all the comments and browsing through your favorites! 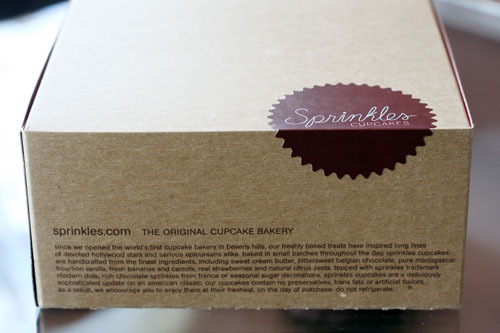 Have you ever seen the Cupcake Bakeshop blog by Cheryl the software quality engineer, aka Chockylit? It was one of the very first blogs I ever laid eyes on and I’ve loved it from day 1. 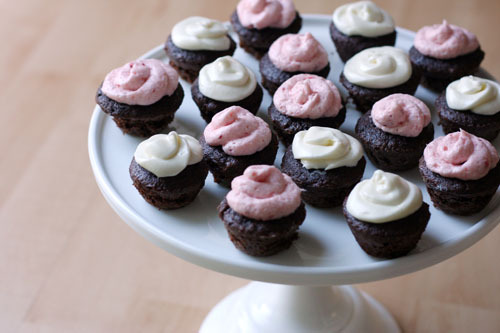 I used one of her recipes and I loved everything about it – the cake itself came out great, and this strawberry frosting? Be still my beating heart…it is perfect. PER. FECT. Beat the butter until it's all nice and whipped. Add the sugar and beat until light and fluffy...as in for a long time, so the butter is completely incorporated into the sugar. Add eggs one at a time, beating well after each addition. Mix the milk and vanilla. Add the flour mixture and the milk mixture to the butter mixture - alternating and beating between each addition, about 3 cycles. I made two kinds of icing, halving each recipe. This is exactly what I made – feel free to double these measurements if you decide to just do one flavor. Beat butter until soft. Sift in the powder sugar and beat. Add strawberry and mix. Add more powdered sugar if you need it. 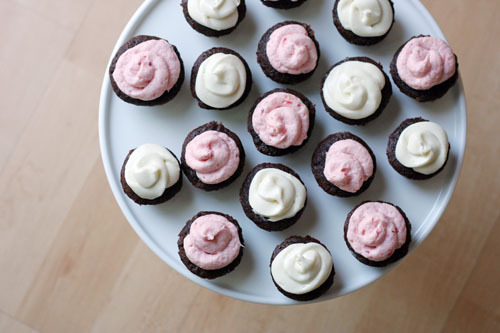 Seriously...this frosting ROCKS. This is about enough frosting for one-half standard batch of cupcakes. Melt chocolate and set aside to cool. Beat cream cheese and butter together. Add chocolate and beat. Sift in powdered sugar and beat for a long while. This makes about enough frosting for one-half standard batch of cupcakes. 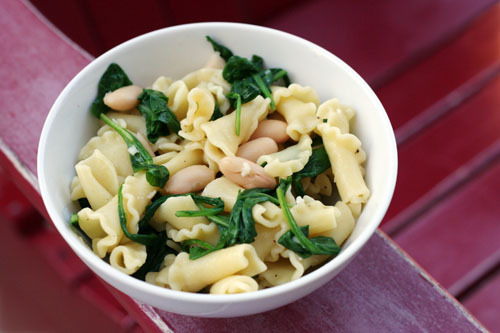 Sunday I made the Farfalle with Arugula and White Beans recipe from Everyday Food: Fresh Flavors Fast. I was very pleased with the outcome of this recipe. It was fresh. It was fast. It was mighty tasty. Not eating meat never tasted so good! We even had a major carnivore over for dinner that night and he loved it as well. 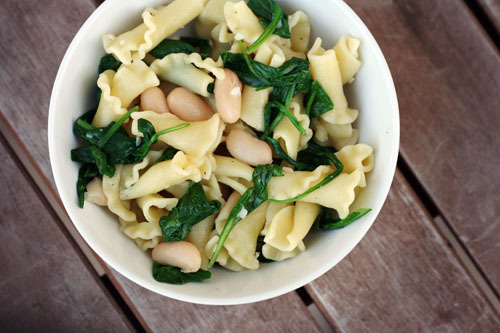 I will definitely be adding this recipe to our regular rotation! Here’s the recipe, with my various notes. Enjoy! Jane addition – freshly grated parmesan cheese to sprinkle on top! Bring a pot of water to a boil; add a generous amount of salt. Cook pasta until al dente according to package instructions. Reserve 1 cup pasta water; drain pasta. Add 1 Tbsp. butter and the garlic to the pot; cook over medium heat, stirring, until garlic is fragrant, about 2 minutes. Stir in arugula; toss just until wilted. Add beans, pasta and remaining 3 Tbsp butter; season to taste with salt and pepper (make sure you taste – I almost oversalted). Heat, tossing, until butter is melted and beans and pasta are warmed through, about 1 minute. Add enough reserved pasta water to create a thin sauce to coat pasta (I think I added about ½ of the cup I had reserved). Mangia! Good Morning! I have a lovely glass of juice for you to start your day. Speaking of orange juice…okay, not really a segue since I totally set it up…but…I keep forgetting to tell you about a Sweeps contest* from Tropicana. They actually set up a special code just for my readers, which means 3 of you will win a prize! Visit the Sweeps page and use the code VALENCIA. Grand Prize is a $50 Adidas card, First Prize is a 1-hour massage from Massage Envy (I will certainly envy whoever wins this, by the way), and Second Prize is a $10 Coleman gift card. The Sweeps end on April 28 at 11:59 PM CT. Good luck! I can’t believe it’s already time for a menu…I looked at the date yesterday and could not believe how far into the year we are. Time, slow down just a bit, won’t you? I just know those little hands holding that glass of juice won’t be little for long enough. I’m sure a few of you will notice I pretty much ripped off most of my menu ideas from you last week. Told ya I read your menus. And love them. And use them. All the time. THANK YOU! So get you’re menus up here! And, don’t think I didn’t notice some of you are slacking off…or haven’t posted in the first place. Hop to it! *No purchase necessary. Ends 4/28/10. Please see Official Rules at website for details. Cambria Cove Mother’s Day Giveaway – $150 Shopping Spree! 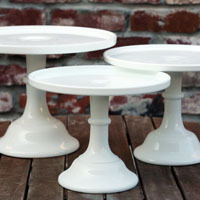 I love my cake stand. I mean really love my cake stand. Last summer, Cambria Cove gave all the BlogLuxe Award winners a $100 gift certificate to their site. 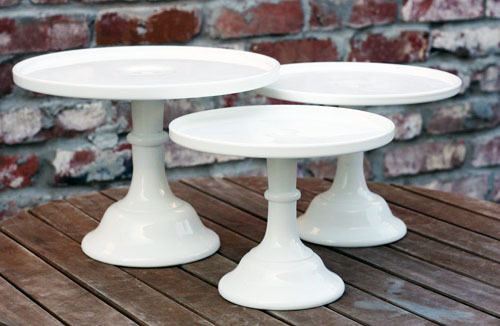 I had a really hard time deciding what to get (they have so many beautiful things), but I eventually settled on the large milk glass serving pedestal from Mosser Glass. When I talked with Cambria Cove about doing a giveaway for all of you, they kindly sent me the small and medium pedestals to complete my collection (thank you, Cambria Cove!!!). Aren’t they so pretty? 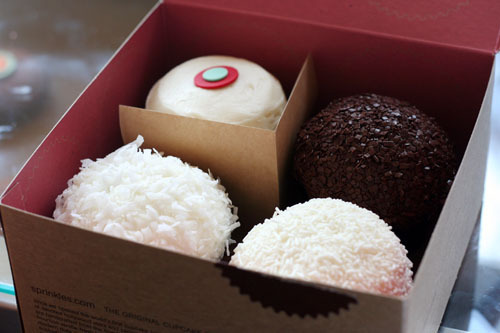 I ate my first Sprinkles cupcake last week. And it was mighty tasty. I took my girls after school one day as a special treat. They of course were in heaven. And, I have to admit, I was pretty happy too. The shop is very cute and it was so exciting for my little ones to stare at row upon row of cupcakes…and then get to pick one of their very own. And then dig in and make a huge mess and eat all the frosting without one peep from Mom. We tried a variety of flavors. 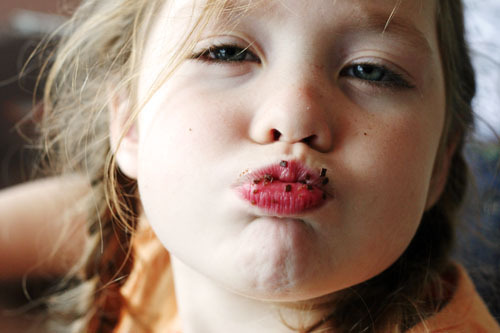 Cate had double chocolate. Anna had vanilla. I had Red Velvet and Chocolate Coconut (no, I didn’t eat two…I split them with Nate…I swear!) I actually really liked each flavor a lot…but Chocolate Coconut was my fave! Darnit. 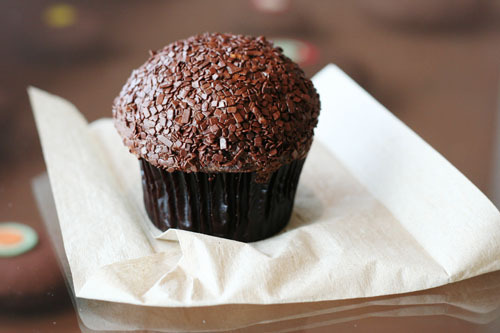 Now I need a cupcake. 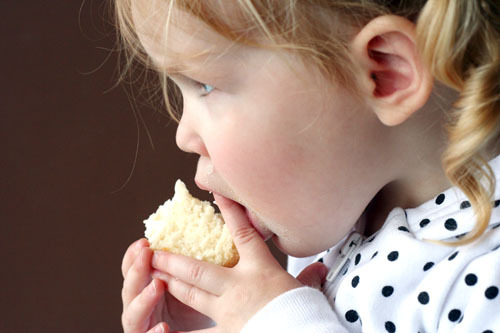 Guest Post on Make and Takes Today: Edible Science! 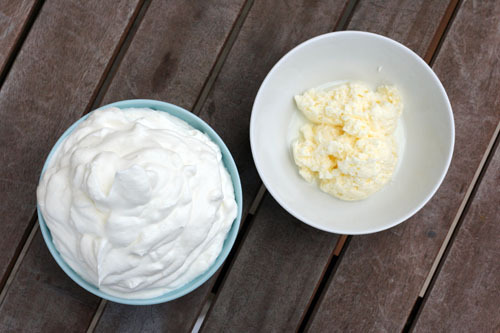 Don’t miss my post on Make and Takes today, Edible Science Experiment: Making Butter & Whipped Cream. Cate and I had a grand old time performing our cream science experiment. If you have kids, this is definitely a fun, easy and tasty project for a rainy afternoon, or any afternoon for that matter! Enjoy the post! Today I just have a healthy and easy recipe for you. It’s so easy, in fact, I hesitate to even call it a ‘recipe.’ This roasted cauliflower is to die for. Trust me. I’ve been popping these florettes like candy for the last two days. Yum! 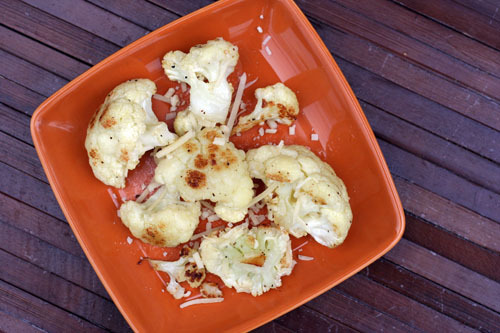 Place cauliflower on a baking sheet or in a 9X13 baking pan. Drizzle olive oil over cauliflower, then salt and pepper. Toss cauliflower to lightly cover all pieces with oil and seasoning. Roast in a 400-degree oven for 25-30 minutes. Stir once or twice during cooking. Check for doneness with a sharp knife, to the point where you can pierce the cauliflower fairly easily but not to the point of mushiness. 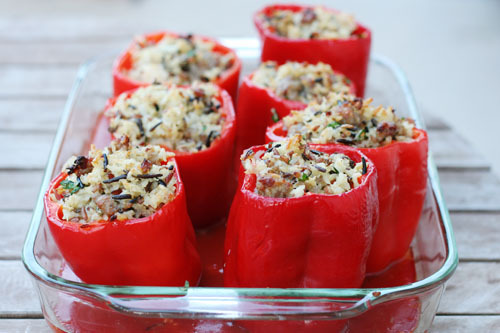 Remove from oven and toss with grated parmesan cheese. 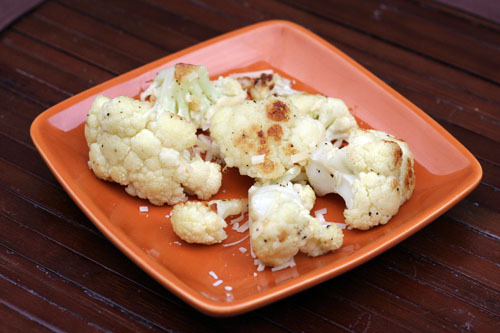 Sit, eat and enjoy the simplicity and buttery goodness that is cauliflower! Week 169 Menu…and Earth Day Meal Planning! I took the girls somewhere very special a few days ago. Can you guess where? This photo is offering up a very good hint. Stumped? No worries…I’ll do a post this week. And I promise it will be scrumptious. Menu time! I’m going completely meatless this week in honor of Earth Day, which is Thursday, April 22! If you haven’t yet joined me on my New Year’s resolution journey, try taking a first, simple step this week…go without meat or processed food on Thursday. I know you can do it! As always, thank you for sharing your menus! I really do read through them every week for ideas…don’t know what I’d do without you! Let’s see what you you have planned this week!